This one claims there are 'no major rips' (well the bottom part of the p[lan isn't there so it's not actually ripped). 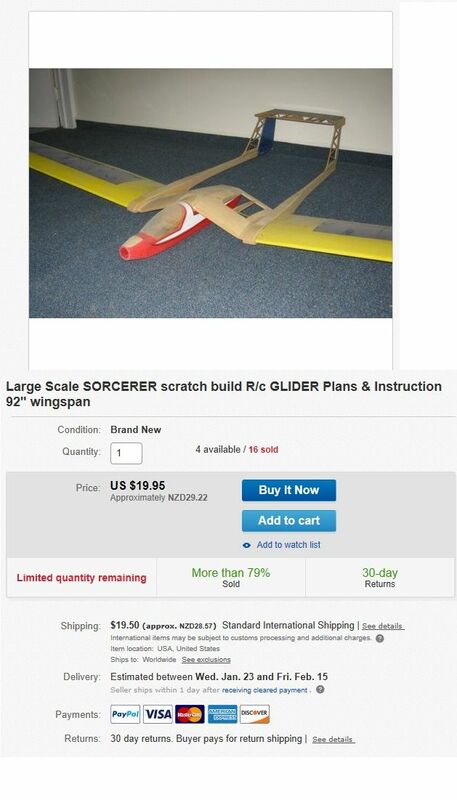 Hope springs eternal in the eBay vendor's breast. What's all the fuss about ? The picture shows the condition and if you don't like it leave it have laugh and forget it . Simple. If its a rare plan and somebody needs it then they will pay what they think it's worth. There's some good deals if you are prepared to look, I recently picked up a MPX DR12 pro Rx for a good price and also had some electrical paste delivered from China (for a £1) to repair a component on a circuit board that was too delicate to solder. Also, as in this post is a source of humor and the day-dreamers out there, but you get that as well in Swap-meets, private sales and the classifieds same. Last swapmeet, there was a Spektrum receiver for sale, at Retford, a AR6200 without it's sat. He wanted £40 no offers. I said you can get a new, with a sat on DSM-X for £10 more, but he said it was collectable, as it was on DSM2...and not made anymore. Someone used my photograph (from here, I think) to advertise his Eezee Pezee kit on eBay. When I contacted him he apologised profusely but it wasn't a big deal for me and we parted virtual friends. Percy Verance: I really have difficulty understanding your dislike of eBay. It's a very useful means of sourcing just about anything. Just this past few days I managed to find a pair of cycle forks I needed to do an electric conversion on a bike and some 8mm aluminium rod to fit a pannier frame to the same bike. I use it regularly and many of the advertisers are the very model shops you advocate dealing with (as do I btw). I've sold loads of old motorcycle components (magnetos etc) which were useless to me but I knew were valuable to anyone restoring an old bike. eBay is a very useful means of putting sellers of both new and old stuff in contact with willing buyers. The only problem I've had was a non-paying bidder for an old Michelin man electric tyre inflater which was merely an annoyance. eBay is simply a way for people from all walks use it as an easy means of advertising something to a wide audience in the hope of making a sale. Just like real life, dreamers, tyre kickers and tat peddlers are common alongside the businesslike and serious, and just like real life, up to us to decide which is which, and who is who.